LOS GATOS software engineer Peter Roizen reached a boredom point with Scrabble after years of fervent word-jockeying. He desired a similar family pastime, but one with a subtle twist. And subtle it was. All he did was throw in one little ditty that added an entire new dynamic to the game. The ditty? A wild letter. His new board game, Wild Words, plays just like Scrabble but includes tiles with an asterisk that can represent any letter or string of letters. So five tiles played as DI*TE can stand for either DICTATE or DISCOMBOBULATE. Like the chaos theory mantra of a butterfly flapping its wings over Brazil eventually causing a thunderstorm over Alaska, with just a few tiny changes to the game of Scrabble Roizen has created a monster. If you're proud of your etymological prowess, Wild Words will discombobulate you at first. It's Scrabble to the 20th power. But once the technique settles in, any word maven with a penchant for creativity will dive in headfirst. If you're a crossword puzzle aficionado, you better watch out. This game will make your brain spin its wheels. Tired of resorting to those miserable two- and three-letter words in Scrabble? Think you're smarter than that? Welcome the wild tile, my friend. Think about it. Let's say you have these tiles at your disposal: ACHHP*R. You could then make the word CHRONOGRAPH if you want. If you have these tiles: GATPS**, you could throw down PATHOGENESIS. Wow. When another player then places a word perpendicular to yours, he can use the asterisk for whatever he wants as well. He doesn't have to be confined to what you used it for. However, the asterisk tiles don't get any points, so you must beware. There are only 12 asterisk tiles total, but they make all the difference in the world. What's more, and herein lies the rub, with an asterisk tile you only have to explain what the letters stand for if you're challenged on it by another player. So colossal bluffs are absolutely encouraged. If you throw BR*UTH down on a triple-word score and no one calls you on it, you're home free. In this way, bad spellers might rack up more points than usual, if they're not challenged. All these elements completely turn Scrabble on its head, and since Wild Words allows much longer words, the creativity is endless, which often leads to miraculous comebacks and upsets. 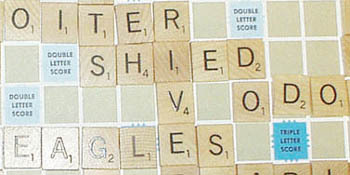 Roizen calls it the Olympics of Scrabble. Who would have thought that an asterisktraditionally a symbol used to designate an omissionwould lead to so much fun? If only someone could now revamp Chutes and Ladders, then we'd really see some progress. From the October 20-26, 2004 issue of Metro, Silicon Valley's Weekly Newspaper.